Mayor Steve Schewel will open programming at 10 a.m. with remarks about the resilience of Durham and outpouring of community support. We encourage everyone to arrive early to observe the moment. 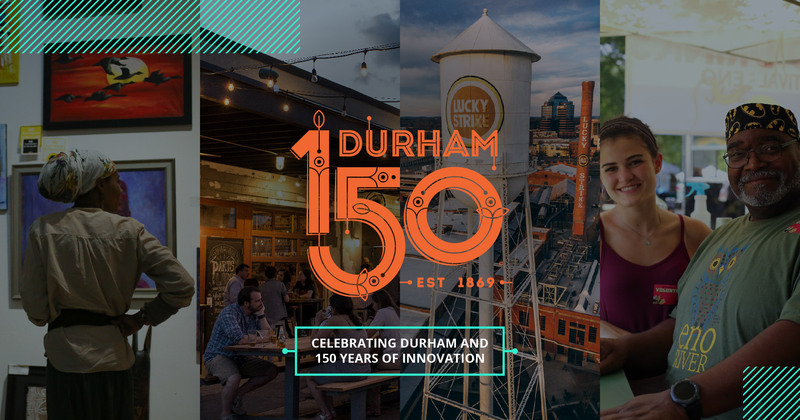 Themed neighborhoods in the American Tobacco Campus (ATC) will highlight the four pillars of Durham 150: History & Education, Innovation & Entrepreneurship, Social Equity & Robust Democracy, and Arts & Leisure. Each neighborhood will feature local experts, artists and community leaders hosting exhibits, crafts, and demonstrations. Visit all four to enter drawings for prizes that will include entertainment and staycation packages from Durham businesses. Enjoy complimentary birthday cake, as well as other activities like live performances, a story kiosk, a photo mosaic mural, and a “Running of the Bulls” race of floatable bulls down the ATC river. Planning on being there? Let us know.